1 of 2 Heat oven to 400 degrees . On a rimmed baking sheet, toss Brussels sprouts with 1 tbsp of the oil, 1/4 tsp of the salt and the pepper. Roast at 400 degrees for 15 minutes. Mix and roast another 10 minutes. If roasting at the same time as the cauliflower and broccoli, swap racks. 2 of 2 In a large bowl, whisk vinegar, remaining 1 tbsp oil, the mustard and remaining 1/4 tsp salt. 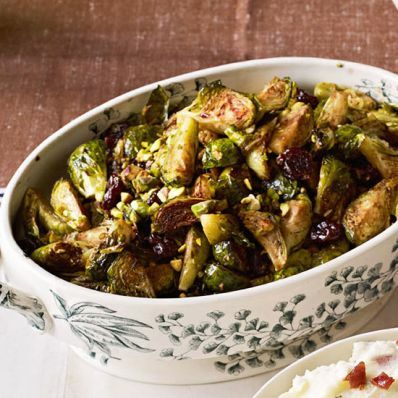 Stir in roasted Brussels sprouts, pistachios and cherries. Season with freshly cracked black pepper, if desired. Per Serving: 1 g sat. fat, 0 mg chol., 5 g fiber, 18 g carb., 6 g Fat, total, 136 kcal cal., 188 mg sodium, 5 g pro.